Across Latin America a racial hierarchy exists, a colonial legacy which manifests itself in the system of domestic labour in Peru. A photographer relates her personal experiences with the empleadas in Peru. 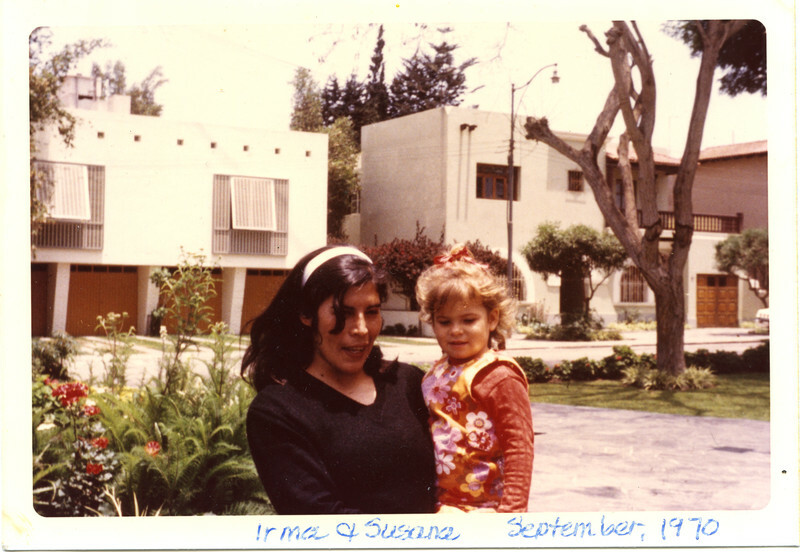 Her name is Irma and I only remember this because it is written on the photograph taken September 1970 in Lima. I look comfortable in her arms. Like Cleo, the main character in Alfonso Cuarón’s Roma, she is imprinted in my memory as pure feeling: safety and love. This depiction I acknowledge is too simplistic of her experience. But our time together was brief. I was not have been more than four when my parents separated and I relocated to the United States with my North American mother. Nearly twenty-five years later I returned to Lima. Negotiating both padre and patria simultaneously was internally tumultuous. Though the smell of the sea air and the compact 60’s homes in our leafy coastal neighborhood of Magdaleña del Mar felt instantly familiar, I struggled with language and cultural context during my visits to Peru. My father’s friends were a tight group of doctors and their wives who came of age in the 1950’s and 1960’s. They had survived regime changes, agrarian reform, and the time of terrorism that decimated the country in the 80s and 90s ending finally with the Japanese Embassy hostage crisis of 1996. The best part of my visits was spent languishing in their living rooms getting to know these Peruvian family and friend and receive the open, immediate embrace of their welcome. In-home décor the Peruvians did not disappoint. Modern and traditional at the same time, their living rooms incorporated minimal mid-century design with bright paintings in the Cusqueño school of colonial portraiture, always punctuated by objects of gleaming Peruvian silver dispersed throughout. I loved these rooms decorated so artfully, often with ephemera collected from ancestor’s homelands – a German art nouveau loveseat, a Russian samovar, pre-war German China. Tea or coffee would be served on a tray by a servant, not often in uniform, but always native in origin. She would be a live-in, sometimes one of two people. Few were born in Lima, emigrating from other areas of the country, reflecting the urbanization of the country around Lima. I found the presence of the empleadas disconcerting. In truth, up until the 1960’s the presence of live-in help would not have been so strange to me in the U.S. Before then a plurality of Americans had domestic-help, often live-in. According to Ester Bloom in a 2015 article in Atlantic magazine, The Decline of Domestic Help, domestic servants were an “indispensable part of life for virtually everyone who wasn’t a domestic worker him or herself.” In the article’s assertion that the absence of maids is directly responsible for today’s two-income families feeling overburdened by domestic affairs are echoes of the refrain often heard in Lima, “We cannot live without our empleadas.” And like the situation in Peru, this arrangement endured because of the reliance on exploiting a low-wage labour force made up predominately of women and (before reform in the United States) children. “Our darling cholita gringa has come home,” a friend of my father’s would say on my return to Peru. I was surprised to find myself so affectionately addressed with the same terminology used to disparage, for example, the “dirty-cholo” taxi-driver, a paradox reflective of so much I observed about life in Lima. A relic of the colonial casta or caste system, cholo is a word that has different connotations depending upon the culture it is specifying. The word first appears in written text from shortly after the Spanish conquest of Peru in the Inca Garcilaso de la Vega’s Commentarios Reales de los Incas. In it cholo is used to identify mixed bloodlines, so-called miscegenation. Today in Peru cholo, or its masculine or feminine diminutive (cholito/cholita) is a common phrase with positive and negative connotations depending on the context, and reflects the complex, unstated socio-economic rules by abide from the time of the colonial conquest. You cannot have the cultural manifestation of empleada, as I experienced in Peru, without an understanding of cholo and the obsession with raices/roots. Trabajadores del Hogar (domestic workers) occupy one of the lowest stratums of Peru's very hierarchal social system. A significant portion of these employees come from indigenous communities in Peru's interior provinces, seeking opportunity, education, and support for their families in the provinces, they are reliant on the benevolence of their employers to not exploit them. Their continued existence is emblematic of the institutionalized suppression of racial minorities in Peru. The majority of domestic workers are employed in Lima. It is easy enough to find examples of how the cultural disdain of lower-classes manifests itself in daily life. All over Lima, nannies and other empleadas gather to watch children and chat in the public parks of the upscale neighborhoods of Miraflores and San Isidro. A 2015 op-ed in Lima's paper of record, El Commercio, discussed a prevailing attitude among some Limeñas regarding these public gatherings of Peru's domestic servants: "My mom always complains about the park because there are too many nannies." The statement is exemplary of the inchoate attitudes towards these working-class peoples’ right to exist in the public sphere. 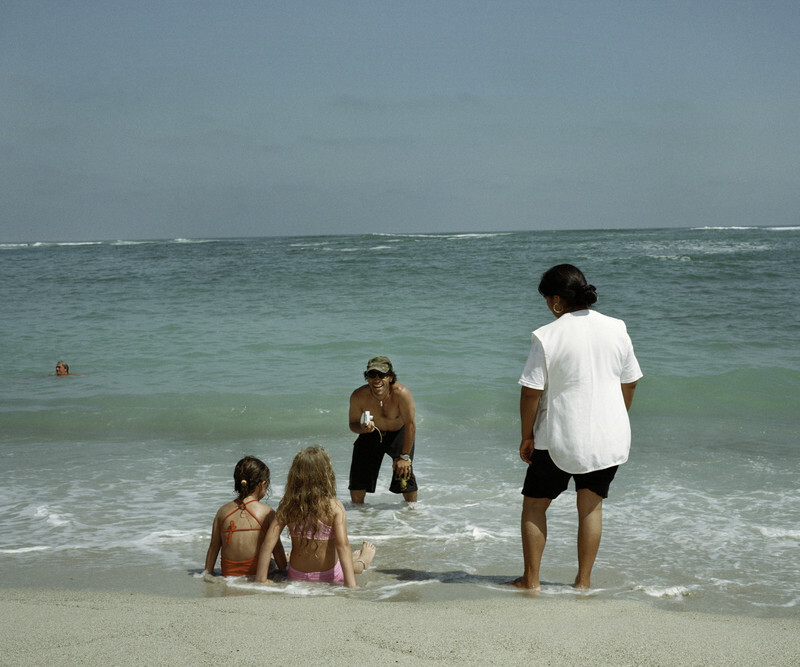 On the beaches of Playa Asia, a private resort community south of Lima, domestic workers were forbidden from bathing in the beaches before 7 pm. They must also wear uniforms on the beach to signify their status. After my father passed away, I found the health certificate for an empleada from 1945 saved among his things. “Who was she?” I asked Margot. “Oh, that was your father’s empleada when he was a child,” she answered. “He loved her very much.” Her beautiful serene gaze in a classic 1940’s roll-up hair-style appears on the photograph affixed to the document, in which the empleada needed to be recertified for good health every 6 months. Every situation I encountered with empleadas was different. I was invited to dinner by a family who had descended from one Peruvian viceroyalty. Their ancestral home occupied an ancient walled block in the midst of a decidedly not tony part of southern Lima. When one passed through the gates onto the curved drive a majestic Colonial home loomed through tropical landscape lush with color. It was as if one had exited a black and white and entered a technicolor feature, the transformation was complete. There, I was served by a multiple of white-gloved staff, experiencing the finest of Peruvian high society. I toured grand receiving rooms filled with centuries old oil paintings and a subterranean library/dungeon containing ancient texts. I understood I was experiencing the purest manifestation of privilege and class as it existed in the Americas. Witness to this living museum of colonial Peru, the exact opposite of Victorian Slum House, I was and am acutely aware of the race and class-based systems of inequity that built this society. In the moment, I confess I dissociate, something I’ve done since quite young when my perceptions and reality don’t match up. “We are two Perú’s,” a friend of mine often says. Us and them. It is not racism, some told me, but rather that they are so uneducated, stupid, and dirty. There is no credence in the idea that a system exists which creates inequities in education, social welfare, and municipal services. During my time in Peru I was fortunate to know several homes intimately, and with each came a different set of empleadas and situations. My father had Callie, not much younger than he, true gold and indispensable to me before and after my father’s death while I managed the house remotely, she came three days a week. There was Modesta, a smart, frustrated woman who with Lucho, a middle-aged man from the sierra, was employed by Dr. And Mrs. A as live- ins. I stayed with them often. It is Modesta who remains with me. The A’s have passed away and I have lost touch. She and Mrs. A clashed quietly. She is insolent, Mrs. A would complain in the morning. But to me Modesta was super-capable – a very competent woman who taught me cooking, we discussed a little of life, and a lot of how she felt about working for the A’s- which true to Peru’s binary code: Dr. A was good Mrs. A not so much. Modesta had an adult daughter and granddaughter but no husband and I did not ask. She squinted constantly because she needed glasses. Modesta, and I admit it was intoxicating. I adored her feisty personality and rooted her silently on while Mrs. A expounded to me of Modesta’s perceived transgressions. I knew my father as an old man. On my last visits, I would clash with him over his treatment of Callie, who in the latter months of his illness would stay around the clock, sleeping on a 3-foot long wooden bench on spare cushions. “Get her a bed!” I exclaimed, incredulous by his indecency, aware this would never even be a battle. His entitlement and sense of superiority was pathological. “You should mind your own business,” he replied icily as I stormed out into the night. This aspect of his personality, informed by mother country, was an egoic fortress erected over years to sustain his superiority complex. How he related to his empleadas was no different than how he related to his children, and I am sure my fury was informed by this recognition. “We are two Perús, “my friend says, and I understand what she means, but I see it differently. What changes your life is not seeing different things, but seeing things differently the critic Ken Johnson asserted years ago. I often find myself in this situation. My sense of dislocation long since became inchoate to my own identity, and while Perú will always be a loved and integral part, I am not bound by the same perceptions. Even as the United States painfully confronts an unjust past, I hope there will be more support and awareness in righting inequities of opportunity and perception Latin American societies. Quietly over ten years I collected these images on walks through Miraflores and beaches around Lima, in friends’ kitchens, living rooms, and backyards. “Why do you take pictures of these ugly people?” a friend of a friend asks. But is it the people in the photographs who are ugly or the cultural narratives that sustain such division? Also, Cholita es bonita.